As One was replete in Cardinal red, yellow black 'N white finery. The second festooned in Seahawks blue, action grey and wolf, while the third wore NO Football garb at all. Instead simply attired in black, which matched Seattle's weather A-L-L weekend long leading up to thy B-I-G' Game. Comforted in the fact that his team, thou Tennessee Titans had forgotten to rub that lump 'O Kryptonite onto thy Pigskin at Halftime vs. Camouthian' "Superman Newton earlier that day. Whilst thou National Football League thinks so highly of the Titans, that their Thursday Night game vs. Jacksonville was the 1st game on the NFL Networks which much of Thy country doesn't subscribe to! As the four Footenballers' set off in Qwest; Uhm in search of 'Der Clink, nee Century Link Field, home of the Seattle Seahawks for the past Sunday Night's game against NFC West Division rivals, thou feisty Arizona Cardinals who currently led the division 6-2 prior to the Talking Heads Albert Michaels and Christopher Collinsworth calling thee game on Thy "Peacock," nee NBC. Yet Snowbyrd MJ had one Ace Up her Sleeve, if she could only get to it underneath the four layers of cold weather gear, as I think it was supposed to be in the high 30's at game-time? As we trundled onto the local Metro Transit bus which is the only way to G-O. As chants of GO HAWKS! 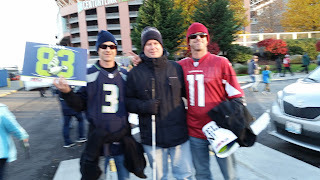 Resonated everywhere, whilst Artiste Dave who was sporting his Cardinals colours noted the proliferation of 12s' flags hanging everywhere in the city! Blogmeister Miguel who was rootin' for Seattle and I rode the freight elevator completely packed with Hawks Fans to our 300-level seats, with the lift's operator even telling us a Cardinals Joke! Yet I was most excited 'bout there being a "Family" bathroom that I could use alone, since this task is always entertaining in crowded confines for somebody who's Blind! As they even had the Pre-game piped in with KIRO's Dorey Montsen announcing there was 72mins left 'til kickoff; CRIKEYS! Seated ten rows from the very tippy-top 'O Century Link Field, I doubt I can accurately describe the mild sensations of vertigo challenging a legally blind person who's only visual reference of the Gridiron below was the massive white stripe running diagonally below soon bathed in white floodlights, for which was simply the boundary of one side of the football field. Unable to even remotely discern one single Ant sized player upon the pitch, which is what I'd stare at for the next four hours after Dave told me to turn my head, you're staring at that woman! 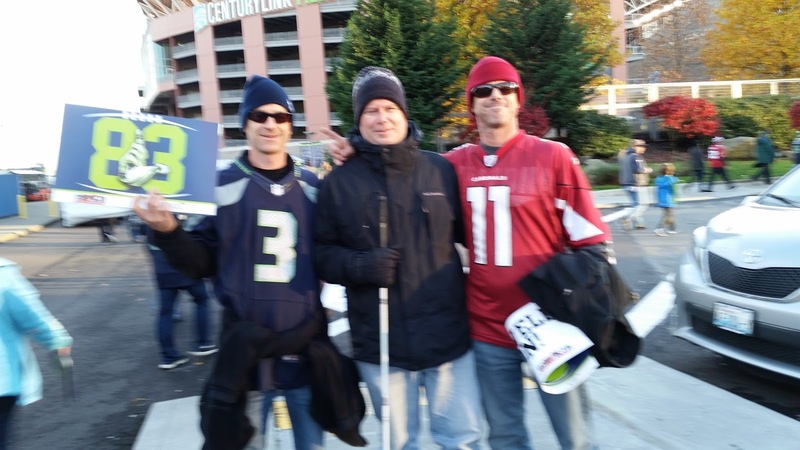 Thus Seattle apparently was in a sporting mood, deciding to spot Arizona 19-points before deciding to show up and play ball! As I stood up, sat down, stood-up 'N sat down again; URGH! Telling Dave I felt like I was in Church at Mass, since everybody stood and yelled when the Cardinals had the football. Then Y'all sit down 'N be polite whilst Seattle's on Offense; Hut-Hut, OOF! Here comes our Punter again. As I was totally bemused when Dave, Dave's NOT Here; Hooah! As Miguel described to Mwah how Russell Wilson had ran into his own man and gotten stuffed in the End zone, resulting in a Safety and making the score then 5-0 in favour of those dastardly Cardinals! Yet it was quite L-O-U-D! Really? Do we need to explode fireworks every time Seattle scores? As the Hawks finally got on the board 19-7. Then the game went to 22-10, and 25-10 all the while Seattle behind. Yet the stadium went Bananas on back-to-back "Pick-6" turnovers, especially the second time when I think somebody said Bobby Wagner returned the Pigskin to give Seattle its first lead of the evening, 29-25! Yet it wasn't to last long. As first Arizona marched down the field and reclaimed the lead 32-29 before Wilson promptly threw an interception and Carson Palmer led the Cards to another touchdown; FRICK! As the fans from our 300-level section filed out in droves with some three-plus or was it the two minute warning? Before Seattle tacked on its final field goal followed by an unsuccessful Onside Kick attempt, losing to Arizona by a final score of 39-32, as what a Donnybrook of a Football game! Not to mention if only Seattle hadn't decided to spot Arizona 19 FREAKIN' points!